Liquid Ooze Inflicts damage on foes using any draining move. "When the enemy uses absorbtion moves on this Pokemon, it loses HP instead of gaining." Sticky Hold Protects the Pokémon from item theft. This Pokemon's item cannot be removed by enemy moves. Gluttony* Encourages the early use of a held Berry. This Pokemon will eat held berries triggered by low HP at 1/2 its max HP rather than 1/4. 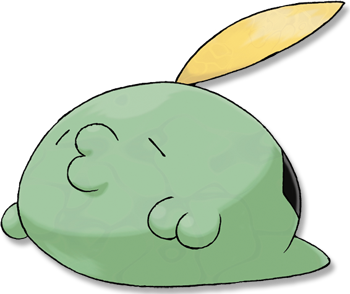 Ruby/Sapphire Most of GULPIN�s body is made up of its stomach - its heart and brain are very small in comparison. This POK�MON�s stomach contains special enzymes that dissolve anything. Emerald This POK�MON�s stomach fluid can even digest scrap iron. In one gulp, it can swallow something that is as large as itself. FireRed There is nothing its stomach can�t digest. While it is digesting, vile, overpowering gases are expelled. Leaf Green There is nothing its stomach can�t digest. While it is digesting, vile, overpowering gases are expelled. Diamond/Pearl Almost all its body is its stomach. Its harsh digestive juices quickly dissolve anything it swallows. Platinum Almost all its body is its stomach. Its harsh digestive juices quickly dissolve anything it swallows. Heart Gold It has a small heart and brain. Its stomach comprises most of its body, with enzymes to dissolve anything. Soul Silver It has a small heart and brain. Its stomach comprises most of its body, with enzymes to dissolve anything. Black Almost all its body is its stomach. Its harsh digestive juices quickly dissolve anything it swallows. White Almost all its body is its stomach. Its harsh digestive juices quickly dissolve anything it swallows.